World War Brick is this weekend at the Embassy Suites Anaheim South on February 10-12th, 2017. This year we have expanded the amount of space available for displays and activities. Daily public tickets and Weekend Passes will be available at the door. Public hours are Saturday and Sunday only, 10:00am to 4pm. The Weekend Pass will be available for people who want to display MOCs (My Own Creations) and participate in all of the activities. We encourage people to sign up early so we offer stepped discounts for early registrants and ticket purchasers. Saturday Public Exhibit: $15 at the door. Sunday Public Exhibit: $13 at the door. Children 3 and under are admitted free of charge! Weekend pass purchasers must be 15 years of age or accompanied by an parent or guardian with their own weekend pass. The Only World War Brick in 2017! We are planning to do only a single World War Brick event in 2017 and Anaheim is where it will be at. 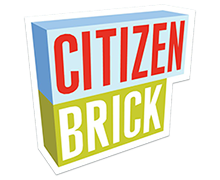 This is THE premier date and location to see the latest creations from the Brickmania team, new product unveilings and a chance to meet the people behind Brickmania, BrickArms, GI Brick, Citizen Brick, Eclipse Grafx, and more! For 2017 we will have new activities, new games, a new benefit cause and just more awesomeness than ever before. Miss out at your own peril! World War Brick Minneapolis Important Dates You Need to Know! Have you purchased your tickets to World War Brick Minneapolis? Brickmania offers two types of ticket for World War Brick: Public Day Pass and the coveted Weekend Pass. If you just want to try a single day of fun, purchase a Day Pass. If you want to experience all three days of fun, including a Brickmania SWAG BAG, special events, raffles for free stuff (kits, minifigures, LEGO sets), and a spot to set up and display your own creation, make sure you get your Weekend Pass. Just a reminder, Weekend Passes sell out quickly, so get them while you can! This year we have chosen the Hyatt Place Minneapolis/Downtown as the official Hotel of World War Brick. The Hyatt Place towers over downtown Minneapolis and is just a few minutes from the Brickmania Toyworks. Weather permitting we’ll even give you are ride to WWB in our Deuce and a Half each morning (and return later). We have changed from our hotel in the past in order to put you right in the action of downtown. You will be able to walk to numerous downtown eating and entertainment venues. You will also be close to Minneapolis’s light rail system if you want to take a train trip out to the Mall of America and visit our store. Check out all the excitement we have planned for you! This year we have confirmed three locations. Come to WWB in Anaheim, CA, Minneapolis, MN or Hartford, CT. The merely curious are invited to attend during the Public Exhibition taking place Saturday and Sunday. During this time you will be able to see hundreds of unique historic military models, shop exclusive items from our sponsors, watch exciting tournament action, meet the craftspeople behind the exhibits, and join games and activities that benefit the Wounded Warrior Project. The public exhibit hours are 10am to 4pm Saturday and Sunday only. Visitors who pre-pay online will be admitted entrance starting at 9:30. Day Passes will only give you access to one day of the event during the public hours of 10AM – 4PM and only access to limited events during the public hours. Prices will increase as the events draw closer, get your tickets today. 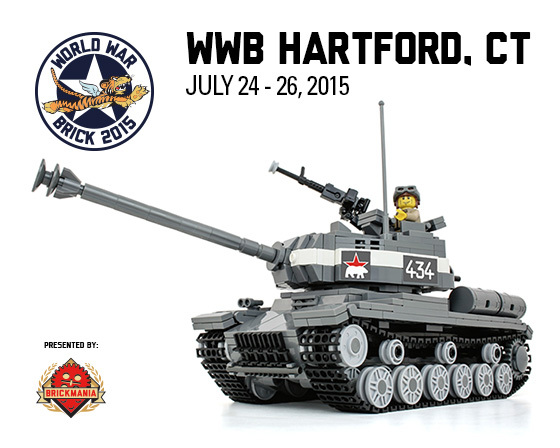 We have recently announced the 2016 dates of World War Brick Anaheim and Minneapolis. As is customary, we are offering the best possible discounted prices for those who sign up earliest. Weekend Passes are now priced at $55 per attendee and prices will increase incrementally until they sell out. Public Day passes are currently $7.50 per person and will also increase in price as the event draws closer. We only offer a limited number of Weekend Pass registrations for each event and they will certainly sell out again in 2016. Keeping the number of Weekend Pass registrations limited ensure that attendees will be able to participate in the maximum number of activities we offer. World War Brick is the the premier historic and military modeling event for the LEGO® enthusiast and is sponsored by some of the biggest names after-market and third party producers. World War Brick Anaheim, CA is taking place February 12-14, 2016, at Embassy Suites Anaheim South, 11767 Harbor Boulevard, Garden Grove, California, 92840, USA. Activities for Weekend Pass holders begins 9am on Friday morning and continues until 5pm Sunday evening. Click the ticket above to order. You can also order advance Public Tickets at a discounted price HERE. 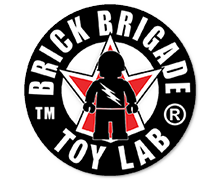 World War Brick Minneapolis, MN is taking place June 10-12, 2016, at the Brickmania Toyworks in Northeast Minneapolis. Activities for Weekend Pass holders begins 9am on Friday morning and continues until 5pm Sunday evening. Click the ticket above to order. You can also order advance Public Tickets at a discounted price HERE. 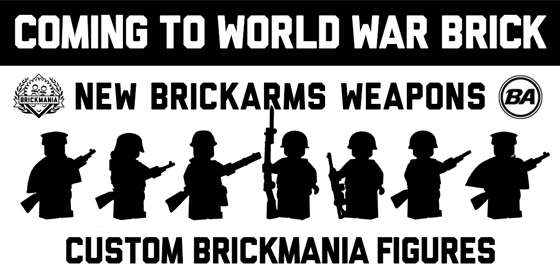 BrickArms will be announcing seven new BrickArms weapons at the World War Brick Opening Ceremonies. These weapons will be available immediately after the announcement at WWB and on Brickmania.com . An exclusive bonus for WWB Mpls attendees, Special Megaton Exclusive Minifigures paired with each of the New BrickArms Weapons available at the event. We look forward to seeing you at WWB Minneapolis this weekend.